Eventility is pleased to announce our latest mobile app, Eventility Scan. Developed specially for organisers to simplify the process of validating event tickets at the door and vouchers at point of sale – It only takes seconds to check-in with Eventility Scan. The Eventility Scan App lets you scan the barcode on Eventility tickets and vouchers. It confirms validity, records the check-in against your account and prevents the same ticket/voucher being used twice. The app supports multiple devices and managers so you can have more than one person working the doors. Simply press the check-in button and use your device camera to validate tickets and vouchers. The Android app automatically installs a barcode scanner if needed. Scan the QR code and within a second we’ll validate whether it’s genuine and hasn’t been used before. You can then analyse all your check-in stats online. The Eventility Scan app is available free on Google play to help make organising and promoting any event or offer really easy. 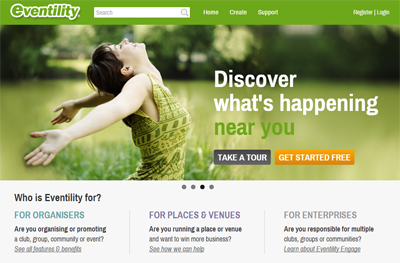 It’s the New Year so Eventility.com has a fresh new look as well as improved functionality and some fantastic new product features. Eventility is now available in the Google Chrome webstore. Click here to get a fab shortcut to Eventility whenever you open a new tab in Chrome and don’t forget to rate and review – we love 5 stars! Plus, lots of other tweaks to the site and bug fixes! We hope you love the new changes as much as we do, so why not go and have a look around on Eventility and try out the new features. There’s also more information on these changes on our Eventility Support Site.